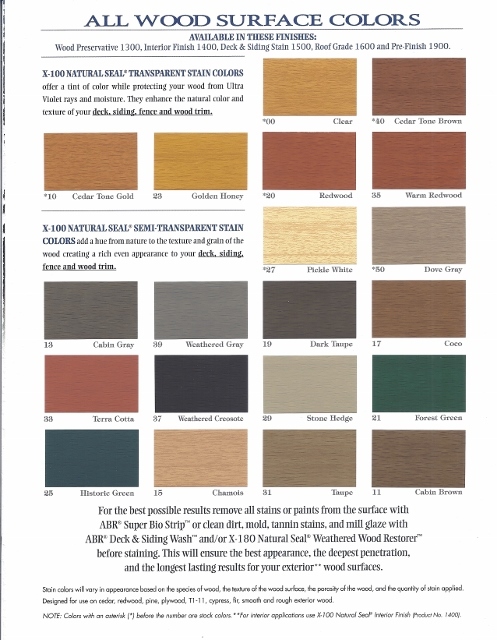 X-100 Natural Seal® Semi- Solid Stain is a semi-solid oil based stain for use on vertical wood surfaces, providing years of color stability and excellent wood protection. It consists of essential wood stabilizing ingredients with deep penetrating micro pigments that produce more hiding film integrity than semi transparent stains. X-100 Natural Seal® Semi-Solid Stain exhibits outstanding water repellency and won’t crack, peel or blister when properly applied. Use X-100 Natural Seal® Semi-Solid Stain on smooth and rough exterior vertical wood, including siding, trim, railings and fences. X-100 Natural Seal® Semi-Solid Stain provide excellent results on weathered wood and well-seasoned lumber such as cedar, fir, pine, cypress, spruce, redwood and plywood, including T1-11.